BRECKENRIDGE,Colo. ? A "welcome home" team of eager scientists is anxiouslyawaiting this month's return of a Japanese asteroid probe and its plannednosedive into Australia because ? just maybe ? it is toting a tiny, butprized, piece of space rock. If all goeswell, the sample return capsule of Japan's Hayabusa spacecraft will parachute down on June 13 overa sparsely populated land within Woomera Test Rangein South Australia. Blazingthrough the sky, the capsule?s re-entry would be both a triumph of stick-to-it-ness and a tribute to scientific curiosity. That?s theview of Peter Jenniskens, the principal investigatorof the NASA-sponsored Hayabusa Re-Entry AirborneObserving Campaign from the SETI Institute in Mountain View, Calif.
Jenniskens detailed thenail-biting role of airborne sky watchers at Meteoroids 2010 ? an internationalconference on minor bodies in the solar system held here May 24-28. The meeting was sponsored in part by NorthWest Research Associates/CoRADivision,NASA, Los Alamos National Laboratory and the Office of Naval Research. 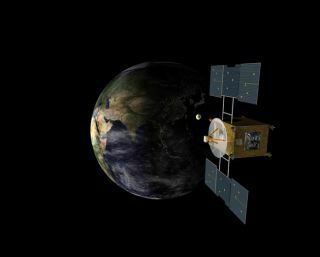 The JapanAerospace Exploration Agency (JAXA) launched Hayabusaon May 9, 2003. The probe was lofted to try out new engineering technologiesincluding a shakeout of ion propulsion, as well as autonomous navigation,sampler and re-entry capsule concepts. In late2005, Hayabusa loitered around and surveyed asteroid25143 Itokawa for some three months, relayingimpressive imagery and science data about the celestial rock of ages. Twosurface sample runs were carried out, but whether or not the asteroidcollecting equipment worked as planned is not clear. However, a specimen ofdust and pebbles from Itokawa may have been snared. After Hayabusa departed the S-class asteroid,it had to overcome numerous engineering difficulties en route back to Earth,such as ion engine woes, broken reaction wheels, a leaking thruster, even alengthy loss of communication with ground controllers. ?Fortunately,they were terrific in tackling these issues,? Jenniskenstold SPACE.com. ?They found a solution every time and that?s really veryimpressive. It is a really big achievement when the object actually comes intothe atmosphere and is brought back to Earth?an incredible achievement.? Jenniskens said Hayabusa?s troubles spurred worry at times that there-entry would have to be scrapped. But now thespacecraft is being maneuvered for its re-entry into Australia. A criticaltrajectory correction maneuver of the spacecraft is set for June 4, followedfive days later with a fine-tuning tweak that refines the return capsule?slanding spot. Also in orderis the legal paperwork for the foreign-made hardware to touch down inAustralia. Hayabusa is truly an import, not only fromJapan but from outer space too. Japan obtained import consent via theAuthorized Return of Overseas Launch Space Object from the Space Licensing andSafety Office of the Australian Government. Hayabusa will be the thirdre-entry event directly from interplanetary transfer orbit to the Earth,following in the wake trail of NASA?s Genesisand Stardust entries, said Masa-yuki Yamamoto ofKochi University of Technology in Japan. At themeeting, Yamamoto detailed the ground observation equipment being set up torecord Hayabusa?s fiery plunge. Threeoptical stations are being installed near the WoomeraProhibited Area in Australia to profile the capsule?s ablating thermalprotection system. Additionally, infrasound and seismic sensors will beinstalled on four stations to detect atmospheric shock waves emitted from theincoming capsule, Yamamoto said. The returncapsule is outfitted with a parachute that provides high reflectivity for radarsignals and a radio responder to locate it within desert brush. After recovery,the sample return capsule will be taken to Tokyo, opened there to assess if itindeed holds treasured bits of asteroid Itokawa. The Hayabusa Re-Entry Multi-instrument Aircraft Campaign makesuse of NASA?s DC-8 Airborne Laboratory. On the spacecraft?s re-entry day, theinstrument-packed aircraft will be flying at 39,000 feet in a race-trackpattern at some distance from the landing site. Aninternational lineup of scientists will be onboard, Jenniskensnoted, at the ready to flip the switches on an array of equipment, from highdefinition TV cameras, intensified cameras, high frame-rate cameras,near-infrared sensitive cameras and spectrographs. Mounted to numbers ofaircraft windows, this gear will attempt to snare the light from the capsuleduring its speedy and heated entry. Jenniskens is no stranger toeyeing human-made meteors. He ran a similar airborne campaign for the Stardustsample return capsule entry in January of 2006 and took part in observing theSeptember 2004 Genesis spacecraft re-entry. He was alsoa principal investigator for the joint European Space Agency/NASAmulti-instrument aircraft campaign that monitored the controlleddestructive re-entry over the South Pacific of Europe?s 13-ton AutomatedTransfer Vehicle, the Jules Verne, in September 2008. ?Every oneof these so far has had its unique challenges,? Jenniskenssaid. ?For Hayabusa we?re basically getting twoexperiments at the same time,? he said, pointing out that the spacecraft busitself will reenter and bust up into pieces right behind the sample returncapsule. It is notclear how well the 16-inch (40-cm) diameter capsule will stand out from thedebris of the main spacecraft, Jenniskens said. The Hayabusa return capsule is unlike the shape of the Stardustcapsule. It also makes use of a different heat shield material to thwart torridtemperatures similar to those seen by a craft zooming in from Mars and akin tothe speed of natural meteors. The 40-pound(18-kg) capsule?s entry, ejection of its heat shield, parachute systemdeployment and landing will occur in the middle of the night in dark-skyconditions. As for theairborne observing campaign, ?to do all the coordination takes a while,? Jenniskens stated. ?This has been in the works for ayear-and-a-half.? Hayabusa will hot-foot itsway toward terra firma at well over 26,000 mph (12 kilometers per second). Asit plows into Earth?s atmosphere and turns into an artificial fireball, thatevent will last all of a minute. ?It?s verybrief. Just leading up to the event is a spike of adrenaline,? Jenniskens said. ?There are second thoughts and worries.When you push the button on your instrument, will it really do what you set outto do? Is the lens cap off? ?